Prepare your minor’s documentation required for registration. Bring your minor and required documentation to the next registration session at our Atlanta office. There you’ll complete paperwork, an orientation and your minor will take a photo for our database. In order for Central Casting to obtain a work permit for your child, they must be issued a certification number from the state of Georgia. To obtain a certification number, visit the Georgia DOL website and fill out the short form. Once completed, you will receive an email with your child’s certificate number (consists of 1 letter and 4 numbers) within 1 business day. Bring this number when you register your minor at Central Casting. Children cannot work on any set without the certificate number, which Central Casting will use to obtain a work permit. Registration is for new SAG-AFTRA and non-union minors. Registration with Central Casting is free. There are no fees associated with employment. Minors have different requirements when registering and must be registered in person. In order to be considered for work, each minor will need a certificate number issued by the state of Georgia on file with Central Casting. To obtain a certification number, visit the Georgia DOL website and fill out the short form. Once completed, you will receive an email with your child’s certificate number (consists of 1 letter and 4 numbers) within 1 business day. Bring this number when you register your minor at Central Casting. Children cannot work on any set without the certificate number, which Central Casting will use to obtain a work permit. Registration is approximately one hour. Ample parking is available in the area at your own expense. Also accessible by MARTA. 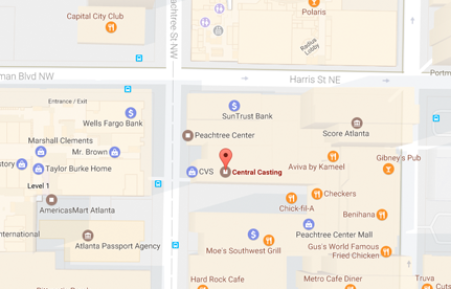 Get off at the Peachtree Center stop next to the mall beneath our building. Call 404.920.8011. If you cancel, we ask that you give us enough notice to replace your minor. PLEASE NOTE: You may not cancel via text message. You must call our office. It is critical that you write down all work information. If you lose your information or if you have any questions regarding work information call 404.920.8011. 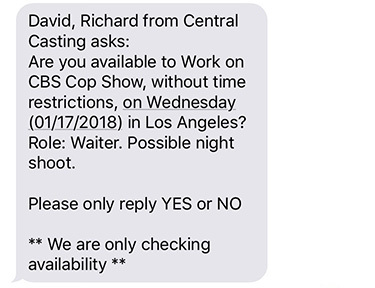 You will be on set with them, behind the scenes. Please stay within your designated area and do not interfere with production. When your minor is not required on set, you both will be taken to a holding area. You can bring items to the holding area to keep busy while your minor is not working. At this time, we do not have the resources for checks to be picked up. Paychecks are handled in a security area with 24-hour surveillance and delivered by our bonded driver to the post office directly. Paymasters do not have access to your paychecks. You can either fax or mail us your stop payment request. You will need to specify in writing that you are requesting a stop payment and include your minor’s name, Social Security number, address and signature, along with the work date and show name for the check you are missing. If the net of the check is over $150, you will need to sign a bank form supplied by our department and have your signature notarized before we can place a stop payment. You can change their status during update times. You must present your minor’s identification along with their current SAG-AFTRA card or receipt issued by SAG-AFTRA and fill out a data change form.